We have often encouraged our readers to use Facebook lists to improve and to provide better privacy and security for their Facebook experience. 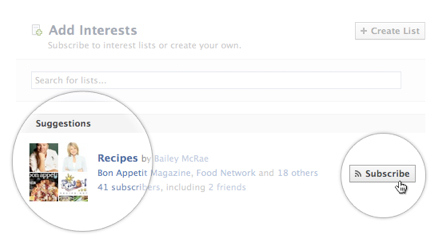 Today, Facebook has introduced another type of list called ‘Interests’. According to their blog post, “Interest lists can help you turn Facebook into your own personalized newspaper, with special sections—or feeds—for topics that matter to you. You can find traditional news sections like Business, Sports and Style or get much more personalized—like Tech News, NBA Players, and Art Critics. Your Interest Lists will show up on the left-hand side of your page along with your other book marks. Add as many friends, pages or subscriptions about the topic that you like. You can even search all of Facebook when deciding what to add. Name the List and choose the appropriate privacy setting. You can choose to make the list public, to share it with your friends or to make it completely private. One thing to keep in mind – If you choose to make it public then your name will show beneath the list as its creator. *This feature will be rolling out in the coming weeks, so don’t be alarmed if you don’t have it just yet.